Paige Pierce has called the Lucid Convict an underrated disc and quite possibly the best fairway driver she’s ever thrown. Maybe that’s why she chose it for her signature disc. Before someone becomes a Felon they must be convicted. It is the same in the disc golf world. 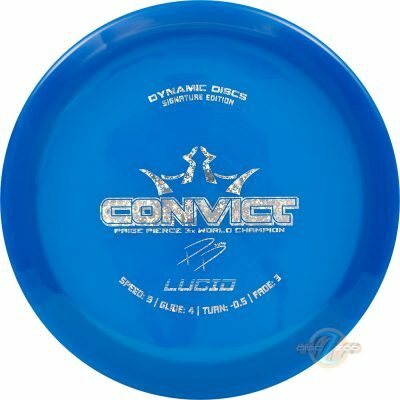 Dynamic Discs introduces the Convict. It is a great complement to the Felon with the same feel in the hand but with less stability. The Convict is perfect for those times when you need a straight disc for most of the shot but have to have some stability at the end of the flight. The Convict can also hold the anhyzer you give it before coming back to flat. This disc allows for you to shape your shots to avoid all of the obstacles that are trying to increase your scores. Throw with conviction. Throw a Convict. Signature disc for 3X World Champion, Paige Pierce.